Well, normally I find popular press stories about getting rid of dust and bacteria to be mostly fear mongering. But this article from WebMD (which much of the time I have complaints about) actually seems worth a look: Are Vacuum Cleaners Bad for Your Health?. The article discusses in part new work from Australian researchers on indoor air quality and vacuuming. The paper is from Environmental Science and Technology: Vacuum Cleaner Emissions as a Source of Indoor Exposure to Airborne Particles and Bacteria. Environ. Sci. Technol., 2012, 46 (1), pp 534—54. DOI: 10.1021/es202946w. The article is currently freely available though I am not sure if that is permanent or not. They then collected and/or analyzed particles and bacteria coming out of the vacuums. Bacteria were analyzed using culture independent methods (i.e., rRNA PCR) to quantify total bacteria in the sample (in essence qPCR). We observed mean bacteria emission rates from cold and warm vacuums between 0 and 7.4 Ã— 105 bacteria min^-1. Bacteria emissions were poorly correlated with those of particles and also vacuum temperature, price, and age. ERs of bacteria from cold and warm vacuums were not correlated. There was no apparent relationship with the presence of an exhaust HEPA filter or estimated dust content (percent full) of the container or bag. Interestingly, the bacteria content of the dust collector was poorly correlated with bacteria emissions from cold and warm vacuums. Our results suggest that different factors are responsible for emission of particles and bacteria across the vacuums we tested. Moreover, the bacteria content of dust in the bag or chamber appears to bear little relation to that in emitted air, indicating that a vacuum containing dust with low bacteria content will not necessarily emit fewer bacteria and lead to a lower exposure than a vacuum with a higher bacteria load in the dust bag. Vacuum emissions are a potential mechanism of spread of Salmonella spp. (6-9) Other bacteria acquired from household dust, such as Clostridium botulinum,(32) could also be disseminated by vacuum cleaners. Both of these pathogens pose the greatest risk to infants. The role of vacuums in spreading pathogenic bacteria or antibiotic resistance genes and the extent to which they may be implicated in transmission of infections are unclear. Our results provide initial evidence on which to base more expansive follow-up studies of vacuum bacteria emissions and can also be used to model indoor bioaerosol exposure. 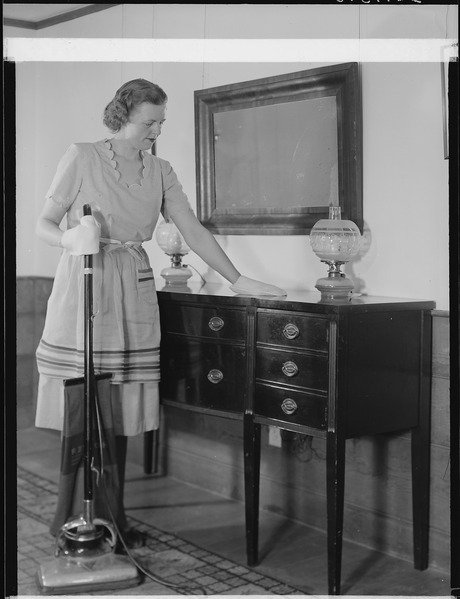 Emissions of particles and bacteria from vacuum cleaners are highly variable, and this is not easily ascribed to the potential determinants we assessed. They are a source of indoor exposure to particles spanning a wide size range, although their significance compared to other sources depends strongly on the individual vacuum and the particle size range considered. Bacteria emissions from vacuums have potential to spread infectious or sensitizing aerosols, and additional investigations to more completely define their characteristics are warranted. Future studies that aim to address the issues raised in this paper will help to further clarify the role of vacuums in human exposure to biological and nonbiological aerosols indoors. The paper is worth a look.